The USAA® Rewards™ Visa Signature® Card offers a rewards system of one point for every dollar spent. Without rotating or bonus categories, cardholders can earn points on everyday purchases, without limit. You can kick off your rewards earnings right off the bat with 2,500 bonus points with your first purchase. Once you’ve racked up enough points, you can redeem them for various rewards. These include merchandise, travel, donations to military groups, gift cards or cash. Each category carries a different minimum of points you will need to begin redeeming. USAA makes it easy to check on and redeem your points on the go, on any computer or mobile device. Along with a pretty solid rewards system, the USAA® Rewards™ Visa Signature® Card comes with no annual fee and no penalty APR. In addition, the card has special Visa Signature® perks. That title provides the card, and you, with extended warranties on your purchases, travel and emergency assistance, lost luggage reimbursement and more. The card also comes with a number of benefits for servicemember cardholders and their family members. The USAA® Rewards™ Visa Signature® Card provides a 4% APR on balances for up to 12 months during deployment or PCS. The Servicemember’s Civil Relief Act (SCRA) also ensures a 4% APR on an existing balance when you enter active military duty. This rate applies until one year after you complete active duty. Then the regular APR at 12.15% - 28.15% Variable activates. USAA continues to look out for its members in the military. They will rebate purchases made on the card while serving in a qualified military campaign. USAA also provides servicemembers with a team of experts to assist with their finances before, during and after deployment. No annual fee - Not a fan of credit card fees? No worries here. The USAA® Rewards™ Visa Signature® Card carries no annual fee. No foreign transaction fee - Any purchases made outside of the U.S. come at no extra charge, making it great for traveling servicemembers. Smart Tip: If you’re planning on traveling overseas and using your card while you’re there, you should give USAA bank a heads up before you leave to avoid any problems. You can do this online through your USAA account. Simply go to the “My Accounts” page, select your card and create a travel notification. Easily redeemed rewards - You can easily redeem your rewards on the go with your mobile device or computer. Identity theft support - USAA provides identity theft resolution services to assist you in the case your identity is stolen. If your identity is stolen, you won’t be accountable for unauthorized purchases. Collision damage waiver - The card comes with coverage that pays for physical damage and theft to most rental vehicles. Extended warranties - With this perk, you get a one-year extension on the warranty from the manufacturer or store when you purchase an item with your card. Special military benefits - Cardholders can get 4% APR on all balances for up to 12 months during deployment or Permanent Change of Station (PCS). When you have a balance on your account when you enter active military duty, you get 4% SCRA APR on that existing balance until one year after you complete active duty. USAA will also rebate all finance charges accrued while you serve in a qualified military campaign. Visa Signature® perks - As a Visa Signature® card, this card also comes with travel and emergency assistance, lost luggage reimbursement, concierge services and roadside dispatch. Keep in mind that only USAA members can apply for the USAA® Rewards™ Visa Signature® Card. That said, almost any USAA member could benefit from this card because of its simplicity in earning points and its wide range of rewards. The card doesn’t carry an annual fee, so if annual fees are unattractive or unsustainable for you, this card would work out nicely. The card also works well as a simple rewards card, one that could be paired with a more extensive rewards card. Almost all purchases qualify you to earn one point per dollar spent, making even your grocery trips pretty rewarding. These features, especially paired with the lack of a foreign transaction fee, can really benefit USAA members in active duty and their families. For every dollar you spend with the USAA® Rewards™ Visa Signature® Card, you earn one point. You can even earn 2,500 bonus points with your first purchase. There is no limit to how many points you can earn, and almost no limit to the kinds of rewards you can earn. You can redeem your points for rewards like cash, merchandise, gift cards, travel purchases or to donate to qualified charities. With this card, it is important to make sure your account remains in good standing. You can do this by making your payments on time and in full. This way, you can keep earning and redeeming your points. Otherwise, your rewards can be held from you unless you contact USAA. Even then, your points may only be usable for cash to pay your balance. You could also gift your points to someone else if you so choose, as long as your account is in good standing. If you expect to make balance transfers, this may not be the card for you. You’ll have to pay a 3% balance transfer fee on each transferred balance up to $200 per balance. Plus, you’ll pay your regular APR (12.15% - 28.15% Variable, depending on your credit score) on any transferred balances. If you’re in the market for a balance transfer card, you’ll be better off searching for one which offers a 0% APR on transferred balances. The only other catch about this card (as is true with most rewards cards) is that you have to pay attention. Rewards cards require an account in good standing in order for points to be redeemable. If you don’t make payments on time, or fail to meet any conditions of the account, you could lose your points and chances at big rewards. Each dollar you spend on qualifying purchases earns you one point. So spending $50 will get you 50 points. There is no limit to how many points you can earn. Balance transfers trigger a 3% transaction fee of the transfer amount. The fee maxes out at $200 per transaction. The APR for Balance Transfers is the same for regular purchases at 12.15% - 28.15% Variable. 12.15% - 28.15% Variable, depending on your creditworthiness. The APR on your card will vary with the market based on the Prime Rate. USAA will begin charging interest on purchases, cash advances and balance transfers on the transaction date until they are paid. However, they won’t charge interest on purchases if you pay your entire balance by the due date each month. Cash Advance 3% of each cash advance ($200 fee max). Fee is waived when transferring funds electronically to another USAA account. If you need some comparisons to other cards before deciding if this card is right for you read on. A card you might want to consider is the USAA Cashback Rewards Plus American Express® Card. It comes with no penalty APR, no annual fee, no foreign transaction fee, concierge services, collision damage, services to military members and more. All these benefits mirror those from the USAA Rewards™ Visa Signature® Card, as well as having the same APR. However, the AmEx card offers bigger rewards. You get 5% cash back on your first $3,000 spent on gas and military base purchases annually. You get 2% back on your first $3,000 on supermarket purchases per year. Then, you get an unlimited 1% cash back on all other purchases. 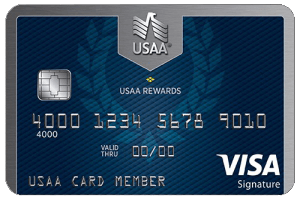 USAA members looking for a solid rewards card should be pretty happy with the USAA® Rewards™ Visa Signature® Card. There are no excessive requirements, fees or conditions that you need to follow. Plus, you can easily redeem your points on the go, which makes it ideal for servicemembers constantly traveling.